It’s July 4, 1946. Eleven-year-old Norman and his best friend Leon are anxiously waiting for the evening’s fireworks display. The two boys also plan to shoot off a few rockets of their own, without their parents’ knowledge, of course. The last thing they want to hear is a stern lecture about how they could lose a hand in an accident. Sadly, on this Fourth of July, Norm never gets to fire off any rockets…because he loses his hand in an accident. Helping out at his father’s butcher shop in the afternoon, Norm gets his left hand caught in the meat grinder. He is rushed to the hospital where his hand is amputated at the wrist. Norm is crushed. He has always dreamed of becoming a major league baseball player, and now he can’t even tie his own shoes! Over the next year, Norm struggles through pain, embarrassment, self-pity, and learning how to do things one-handed, especially playing baseball. What he manages to accomplish, despite his handicap, will take everyone by surprise, including Norm himself. 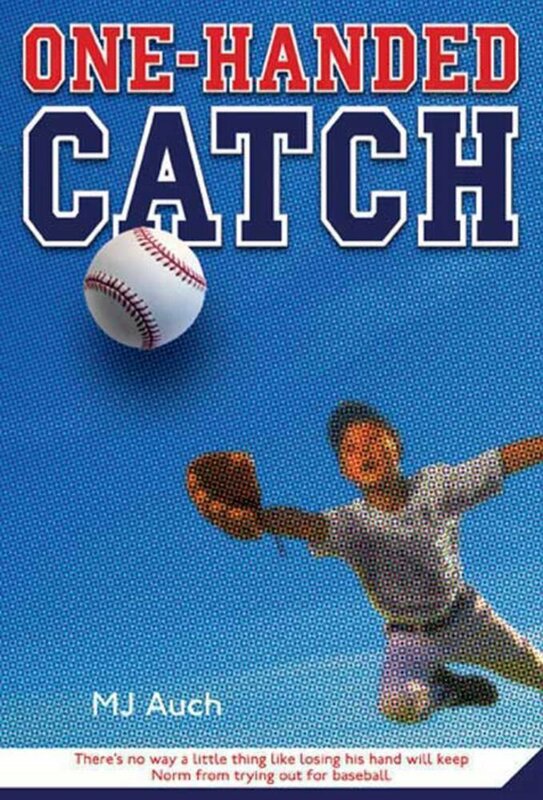 One-Handed Catch, by M.J. Auch, is an inspirational, uplifting story loosely based on the childhood of the author’s husband.